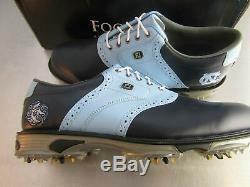 FootJoy 2011 DryJoys Tour MyJoys 53732 Blue UNC North Carolina Tar Heels 10.5 M Try Your Luck! Sof, breathable, waterproof Extreme Comfort Leather. Soft and durable underfoot cushioning. New TPU integrated EVA midsole. Provides increased stability throughout the golf swing. New next generation Tri-density TPU Stability PODS outsole. Soft TPU for superior flexibility. New Cyclone cleats by Softspikes. These shoes are new in the box , and have been closed out by FootJoy. This is a great opportunity to get a premium golf shoe at a great price!! Thank you for shopping at ProGolfSouth. We sincerely appreciate your business, and want to make your entire shopping experience as pleasant and enjoyable as possible. Please check out when all items are in your cart. We will do whatever it takes to ensure your satisfaction. Upon return of the item, we will reevaluate the item, comparing it to the original written and photographic documentation. These clubs have never been played. They exhibit shop wear only. These clubs have been played, but only a couple of times. These clubs have been used extensively, but still retain some playability. These clubs are not playable, and we will not sell them except for parts. Golf balls a very nearly new. Golf balls exhibit some minor marking. Golf balls exhibit some marking, some minor scrapes, or some discoloration. When will my item arrive? Why does it say regular in the title, but stiff in the description? We certainly appreciate the chance to fix the error, and ensure the item is right for you. Fastest Growing Golf Retailer ProGolfSouth is one of the of the largest golf retailers in the country. Thanks to our loyal customers, we are able to bring the best golf products to market at the lowest prices. We Know Golf ProGolfSouth is staffed by PGA professionals, certified club makers, and avid golfers. With this level of expertise, we can answer all of your questions, and find the right product for your game. Golf Augusta of Pinehurst, NC. Come visit us at Golf Augusta in Southern Pines, North Carolina. We are owned and operated by a PGA professional, and we have been serving the Sandhills since 1996. We always like to meet our online customers as they come to Pinehurst to play some of the best golf courses in the world. Just like our online presence, our brick and mortar store is growing extremely fast, and you just might find something not yet available online. You can shop with confidence when you shop with ProGolfSouth. We are a member of the Better Business Bureau of North Carolina. We know that our customers are looking for a safe, secure, and convenient shopping experience, and we work hard every day to accomplish just that. Thanks for shopping with ProGolfSouth! The item "FootJoy 2011 DryJoys Tour MyJoys 53732 Blue UNC North Carolina Tar Heels 10.5 M" is in sale since Tuesday, March 26, 2019. This item is in the category "Sporting Goods\Golf\Golf Clothing, Shoes & Accs\Men's Golf Clothing & Shoes\Golf Shoes". The seller is "progolfsouth" and is located in Southern Pines, North Carolina. This item can be shipped to United States, Canada, United Kingdom, Denmark, Romania, Slovakia, Bulgaria, Czech republic, Finland, Hungary, Latvia, Lithuania, Malta, Estonia, Australia, Greece, Portugal, Cyprus, Slovenia, Japan, China, Sweden, South Korea, Indonesia, Taiwan, South africa, Thailand, Belgium, France, Hong Kong, Ireland, Netherlands, Poland, Spain, Italy, Germany, Austria, Bahamas, Israel, Mexico, New Zealand, Philippines, Singapore, Switzerland, Norway, Saudi arabia, Ukraine, United arab emirates, Qatar, Kuwait, Bahrain, Croatia, Malaysia, Brazil, Chile, Colombia, Costa rica, Dominican republic, Panama, Trinidad and tobago, Guatemala, El salvador, Honduras, Jamaica, Antigua and barbuda, Dominica, Saint kitts and nevis, Saint lucia, Barbados, Bermuda, Brunei darussalam, Bolivia, Ecuador, Egypt, French guiana, Iceland, Jordan, Cambodia, Cayman islands, Sri lanka, Macao, Martinique, Nicaragua, Oman, Peru, Paraguay, Reunion, Viet nam, Uruguay.